When potential customers learn that we can accept barge shipments they often ask "How?" Our facility is adjacent to the Baldwin Terminal on the Kaskaskia River, an inland waterway that connects to the Mississippi River nine miles away. That brings us steel sourced from overseas via the Port of New Orleans or Houston via new Orleans. But it also brings barge loads of steel from domestic mills. For example, steel from Gary and Burns Harbor area mills travel the Illinois River to the Mississippi to TMW. Steel Dynamics Columbus or Arcelor-Mittal/Nippon Steel's Calvert, Alabama coils travel the Tom Bigbee Waterway to the Tennessee River to the Mississippi. Nucor Hickman and Big River Steel are on the Mississippi itself, and Nucor Decatur connects via the Tennessee River. AK Steel coils board the Ohio River at Cincinnati and coils from Gallatin are loaded at their own barge terminal. Pittsburgh and Weirton are the far end of the line for domestic barge loads that are headed to the Baldwin terminal, but with the price of gas being what it is, we've seen more shipments that originate from those far off locations. 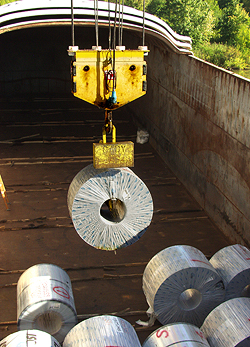 Freight and fuel charges are a constant challenge to steel users. Many get locked into supply contracts where these factors put them at a disadvantage. We may hold the key to help you unlock that problem. We offer the ultimate in flexibility, accepting steel coils from around the world into our climate-controlled storage without ever touching a truck. Barge shipments from the Port of New Orleans or the mills of Gary/Burns Harbor, Pittsburgh, Alabama and Mississippi are unloaded by a 50-ton crane right into our building. Rail shipments, arriving via our dedicated spur on the CN system, are unloaded the same way. But if truck is the mode of choice, it's good to know that we are near the crossroads of four major interstates. Our strategic location near St. Louis is a short haul from the mills of Granite City and within an 8-hour drive of over 50% of the country's steel making capacity. The table below provides specifications for material to be unloaded at TMW. Print a copy for use in your planning. Coil Grab (must have 16"
Coil Width 42" Max. / 12,000 lbs. Max.